Bali has uncounted hidden natures worth your visit, beaches in particular. Among the wondrous beaches in Bali, is Nusa Dua. Located in the southern part of Bali Island, Nusa Dua is perfect for those who seek a luxurious escapade after a hard drilling year. Nusa Dua has been famous for its exclusive complex, consisted of luxurious resorts, 5-star hotels, and restaurants perfect for honeymooners. Located only 40 km from Denpasar (capital city off of Bali), Nusa Dua can be reached easily by car, about 30 minutes from Kuta area. For you who landed in Ngurah Rai Airport, you only need to take about 30 minutes. 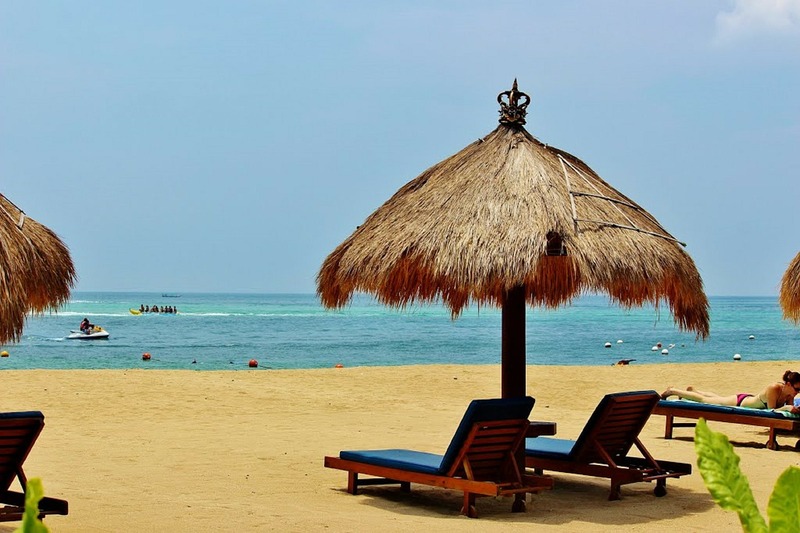 One of the main attractions is the Nusa Dua Beach with white sands and crystal waters. Nusa Dua Beach is among the less crowded, quiet, and cleanest area to enjoy sunsets away from the nonstop partying in Bali. There are three areas of The Nusa Dua Beach – two small peninsulas separated the north and the south part. The north is the main part where the world-class resorts are situated, and the middle part where it leads to two small peninsulas. On the main part, along the pristine coastline are beach resorts to pamper you during your stay with your families and loved ones. Lounges, pool bars are easily found here with an appealing vibe. No need to worry about the activities you can do in Nusa Dua Beach, or known as Mengiat by the locals. Relax! Lounge at the beach for there are amazing bathing facilities. They have small playgrounds for children, soccer and volleyball fields. To complete your water sports adventure in Nusa Dua Beach, don’t miss kayaking and stand-up paddling. Surfers will also enjoy here with great windsurfing. There is also a spot called Water Blow. It is a spot in Nusa Dua peninsula north of Grand Hyatt Hotel where the waves crash into the rock formation, creating a giant splash like it’s blowing up. This magnificent natural attraction is promoted by holding international events and world-class exhibitions. Keep in mind that this area also has a dangerous cliff but has been managed by creating a path and guard rail. Visiting this area carefully is a must while enjoying the wonders of nature around you. Another spot you can’t miss during your vacation in Nusa Dua is Pantai Geger (Geger Beach). This beach is public, where you will find a splendid white sandy beach as far as the eye can see. Along the beach, you can also find warung (small café) providing visitors with refreshments and dishes. This beach is mainly occupied by the locals. The interesting fact about this beach is that the water has one of the warmest temperatures and cooling breeze, making it perfect for swimming. You can also lounge all day at the beach and hire massage ladies to relax your body. During the day, you will find an upper market shopping complex with well-maintained facilities and manicured gardens. An 18-hole golf course is also available to fulfill your luxurious journey in Nusa Dua. What makes it irresistible is that all those facilities can be reached by walking from your favorite hotels. Nightlife isn’t the main option here because Nusa Dua is designed mainly for recreational and families although you will still find a couple of bars. For you who loves artsy stuff, Nusa Dua has numerous artsy attractions and cultural sites not far from the beach. Temples, souvenir shops are ranging along Nusa Dua’s Jalan Pantai Mengiat (Pantai Mengiat street). You also can’t miss an expansive collection of Asia Pacific Arts at Pasifika Museum. Pasifika Museum is carrying the mission to show more than 600 arts from the Asia Pacific of arts in many style and forms. Preserving diverse traditions from Indonesia, Indochina, Polynesian, Tapa, and even Italia and Dutch. Unfortunately, this museum is quite underappreciated, so you won’t find many people. However, that means you get the whole museum for you to enjoy to your heart’s content. Overall, Nusa Dua Beach is perfect for those looking for some exclusive vacations with your families and for a honeymoon. The beach is clean and secluded while the water is also clean and perfect for some watersports. The resorts along the beach will give you top-notch services and the facilities in the surrounding area are ready to satisfy your every need.